The order of columns isn't important. You can also import one, all, or specific set of columns. It depends on what you're importing. Quick tip: The easiest way to see how your CSV file should look like is to export a Detailed report into the CSV. Note: When importing time entries, the end date and end time are ignored. These are calculated automatically by the importer, based on the start time and duration. All displayed files were made with Open Office, saved in CSV comma separated format, and have UTF-8 encoding. If the imported user already has a Toggl account for that email address, whatever name they've set will be used. The required fields are highlighted in light blue above. You need at least an Email, Start date, Start time, and Duration to import a time entry. As the Billable column indicates if a time entry is billable or not, the three acceptable formats are y or n, yes or no, 1 or 0. Regional settings – make sure that your list separator is a comma. 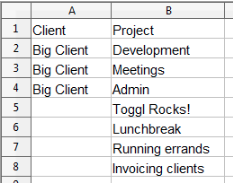 Date and time fields – they must be in the required format as explained in Importing time entries above. If you don’t manually import the file and set the fields to “Text”, Excel will likely change your date/time fields to a different format. UTF-8 export – some Excel versions struggle with exporting UTF-8. If Toggl rejects your CSV, open it in regular ol’ Notepad and save it as a new CSV file encoded in UTF-8. You should see the “Encoding” option inside the Save As window. Data can be imported to Toggl from a CSV file by uploading the file via the Import/Export page. Once there, click on “Choose file” and upload your CSV. The importer will analyze your file and show an error if it can't be imported. You will also see what you will be importing (how many projects, users, etc.). If everything looks good, click “Import now” to complete the process. The app always displays the “Adding new users increases your workspace fee” warning. If you’re uploading time for existing users, just ignore this. Users added with CSV import are active immediately and are considered to be active users. Be careful if you’re on a paid Toggl plan, as this could affect your billing.